Fiber folk: Earlier this Spring I received a very endearing email from a woman named Emmaline, a 24 year old sheep farmer in western NY and owner of Orchard View Lincoln Longwools. 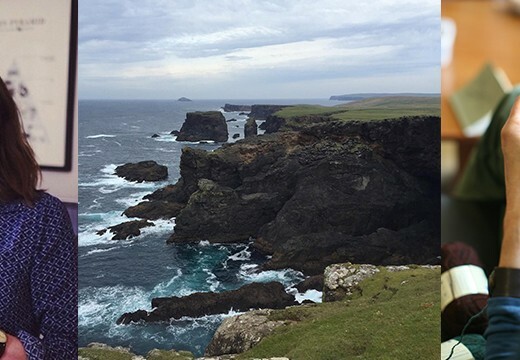 As Emma began to share a bit of her story, having started her flock at age 12, building her business with her father over the years and now venturing into the wool aspect of her business, I knew the rest of you should hear her story too. 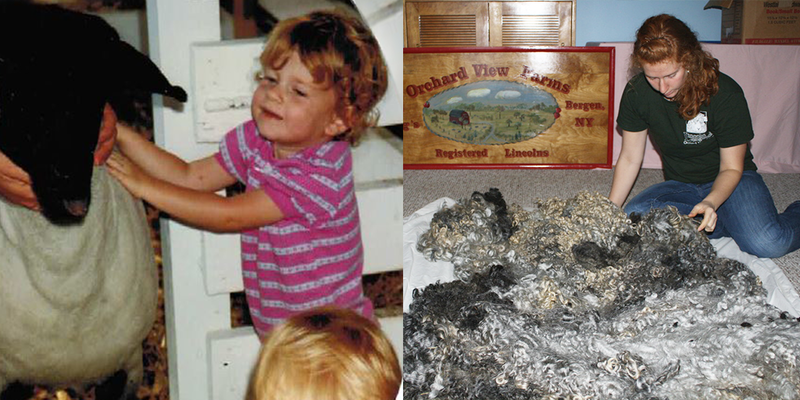 In the fiber farming and production side of the fiber industry I don’t often meet other young folks, especially ones with such spirit and gumption as Emmaline…so I hope you find her story as inspiring and encouraging as I have. You can find Emmaline at orchardviewlincolns.com and on Facebook at Orchard View Lincoln Longwools. Sponsor: I want to thank our other sponsor for this week’s episode 6 Bits Storybooks, a digital quarterly publication for knitters who love to immerse themselves deeply in their knitting experience…from the mouths of story tellers: knitters, photographers, writers, designers, friends & nature. These storybooks incorporate designs, imagery, location, words, learning and tools to create an deeply engaging experience, taking readers on a journey. 6 Bits was created by two incredibly passionate and inspiring folks within this community, Melissa and Melody, and this past week they launched the first issue of this beautiful digital editorial magazine, so visit 6 Bits Storybooks at 6bitsstorybooks.com to subscribe and find them on Instagram @6.bits.storybooks, @mskiknits and @bmandarines. Update: If you follow me on Instagram, you’re most likely aware that we recently welcomed some new members to the family…Henry our badger face Icelandic ram lamb and Lulu our Dexter cow. We got Henry a couple week’s back and he’s been hanging out with the ladies. This is his first time to the rodeo, if you know what I mean, and I’m not entirely sure he’s aware of his job…but alas nature will take it’s course eventually I’m sure and hope…haha. He’s a cute little guy, with the softest lambs wool and spunky personality. But as much as I love Henry and the eventual lambs he’ll hopefully help bring to the farm, Lulu has captured my heart in a very special way. 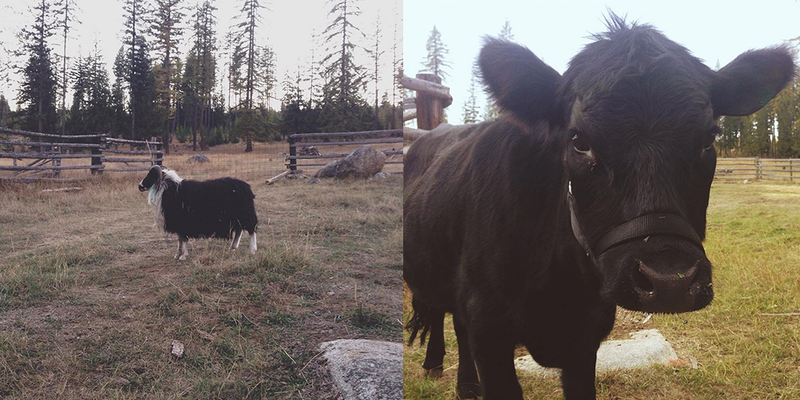 We have some exciting plans we’re working on here at the ranch and as a part of that I had been researching dairy cows. I settled on the Dexter breed because of their heritage breed qualities, size, demeanor, milk production and dual purpose. I’ve always been curious of those people who LOVE cows. You know who I’m talking about…they have a bajillion pieces of cow knick knacks and photos in their house…but now I’m not so curious…I kinda get it. Cows are AMAZING! haha. Ok, don’t worry, I still very much love sheep…but just like folks tell you that when you have another child you don’t split your love, you multiply it…well Lulu has multiplied my love…times a thousand. Her eye lashes are unbelievable and her soft wet nose is so adorable. Ok I’ll stop. Well, she’s due to have her first calf the end of May and then we will begin our milking adventures…until then, stay tuned on Instagram for all my circus updates…including one next week…when we welcome 6 alpacas to the ranch. Giveaway: The winner of last week’s giveaway is, Ivy Perez. 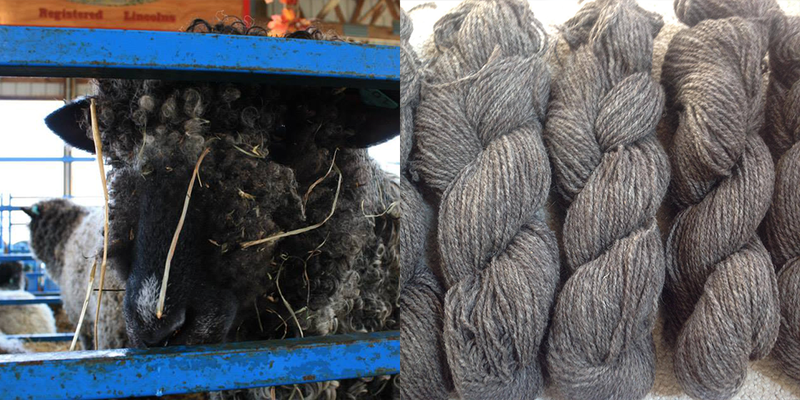 You’ve won 2 skeins of a wool and alpaca blend 3-ply yarn, naturally dyed with Logwood from Lost Coast Yarns. Congratulations! This week’s giveaway is sponsored by Orchard View Lincoln Longwools, and they’re giving away 2 skeins of naturally colored Lincoln Longwool 2-ply worsted weight yarn. To enter this giveaway, leave a comment on this blog post. It was fantastic to hear from someone so passionate about the sheep that bring us all so much crafting pleasure. The genetics of sheep and what goes into the creation of different breeds and qualities of wool is fascinating. Thank you for sharing Emma’s Story with us! What a sweet and fascinating story! Thank you for putting up such an interesting, in-depth interview with Emmeline– letting her tell her story fully with little interruption and asking good questions to round out the experience for listeners! Very enjoyable! And Emmeline– good luck! 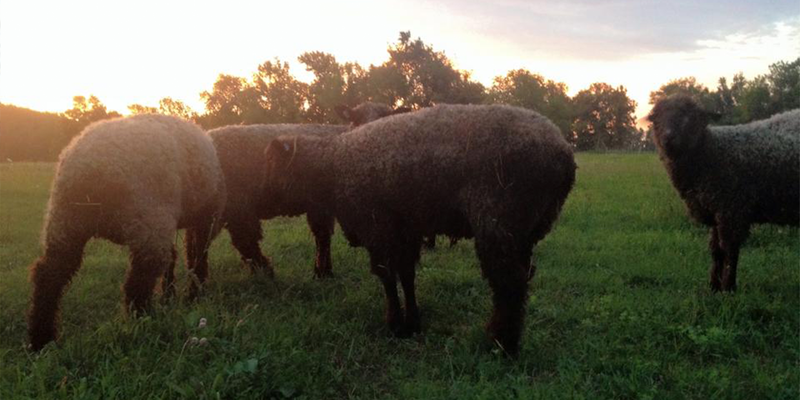 Looking forward to listening tomorrow, the Lincoln longwool sheep look great! I literally cannot wait to listen to this one! Can’t wait to listen to this in the morning!!! What a wonderful podcast episode! Each new one seems to top the previous one! I know you have a lot to do on the new farm in Idaho, but I hope you are able to keep these podcasts coming–I look forward to them and can’t wait for the next one! This is a remarkable and lovely lovey story! 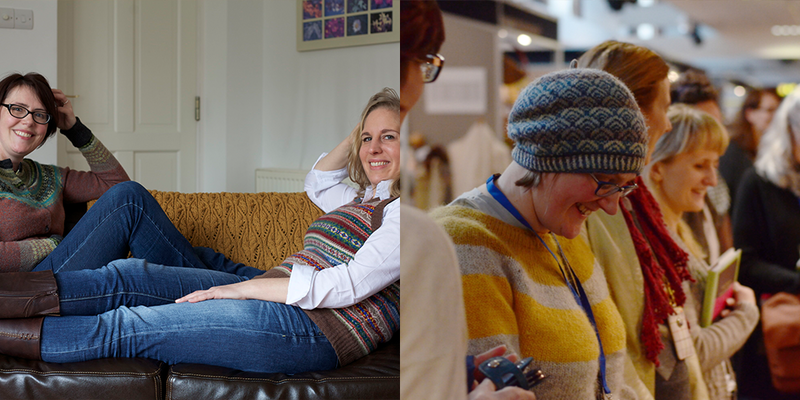 I am so happy to be able to here about all these wonderful woolfolk people! This is sweet. Congratulations to Emmaline on living her sheep-y dream. 🙂 Can’t wait to listen later today. Delightful to hear a story about the next generation of fiber folk and to know the fiber world is in good hands. No need to worry about the craft becoming extinct! Thanks for a wonderful story. Great story! It’s so cool hearing from other young people who are pursuing fiber dreams. Loved this episode. I also want to meet Henry, your cow! I would love the opportunity to work with this beautiful longwool yarn; I’ve begun my search for more naturally processed wools and their different prospects and uses. Yes please! Man I would love to buy one of her fleeces one day! Like you, I always get excited when younger people are involved in the fiber industry. I think it’s amazing that Emma is so dedicated to raising her flock. She has poured so much of herself into raising these amazing creatures and helping sustain the breed. I’m inspired by her perseverance and commitment. I’m just slightly older than she, and I can’t imagine maintaining a flock mostly alone! So excited about the yarn!!!! Thank you!!!! Gahhh! I just want sheep. Just one. or 20….. I look forward to this podcast every week! Thanks for another lovely episode. I was so thrilled to listen to Emmaline’s passionate love of sheep, and excited to look her up and find that she that she is a local fiber gal! Another inspiring podcast. My sister, a veterinary technician, attended an agricultural college, so I had a glimpse of the world of animal showing. I agree with Emma that advocacy and education are so important to help people understand where the things they consume on a daily basis come from. And I love her passion for a longwool breed — as a spinner, my experience has been with breeds like the Border Leicester and Romney and I’ve come to love the sheepiness of the yarns that fibre produces! A very interesting podcast, especially following Rhinebeck with the sheep and the showing there. Thanks for the giveaway too. Lovely to hear from a young woman so passionate about sheep and agriculture. Thank you. Loved hearing Emmaline’s sheep showing stories! I grew up showing Guernsey cows, and every family vacation was part of a dairy show or breed conference. It’s something so few people understand, excited to see it here. Thanks, as always, for a great podcast. It is wonderful to know that there are young people working to keep and expand the farming and fiber cultures here in the US. Congratulations to Emmaline! And congratulations to you, Ashley, on your new farm family members. Can’t wait to hear the plans for fiber… and the milk! I enjoy listening to all the stories and daydreaming about what life could be like, rather than what it is. Oh, I love this. Thanks for the chance to win. I want to try more single breed yarn. The talk of genetics and resesive genes really appeals to my scientist side. The wool is also some of the most interesting I’ve ever seen. The silver and black colors are amazing and made me realize that you very rarely see the whole range of natural colors possible in a yarn store, even rather nice ones. It seems with the big trend for “natural, “artisanal”, “local” and so on and so forth—demand for naturally colored wools, especially the silver and black, would really be large and yarn sellers would be featuring them a lot. Seems like people should be really excited to use real black yarn rather than died yarn. Again, there may have been a lot of naturally colored yarns in stores I’ve been in before; however, they certainly weren’t advertised or featured. I doubt I am the only person walking in that would be particularly interested in those fibers. I guess it’s more a problem of advertising… Why aren’t they…? Great podcast. Lots of new info. great episode. The future is safe in Emmaline’s hands! What a sweet note Emma wrote as a young girl! Would love to try some of her yarn! This yarn looks so inviting. No superwash, no dye…just naturally beautiful. I’d love to make a hat for my grandson out of it. Husband, too! After a long abscence this was just the podcast that I needed to hear! Over the summer we moved from Washington DC to the Bay Area and it has been quite a transition. The life of a Coast Guard family can be a bit tough at sometimes but also adventurous! I look at our last two years in the military and exploring the Bay Area as an educational process and this is the perfect area to educate ourselves for our future farm! 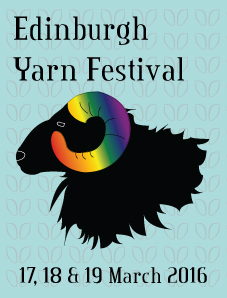 Next month we will be hitting the Fibershed’s Wool Symposium and I am thrilled about this! Emma’s podcast was a special one – her enthusiasm for the breed and her love of sheep was truly inspiring to me. 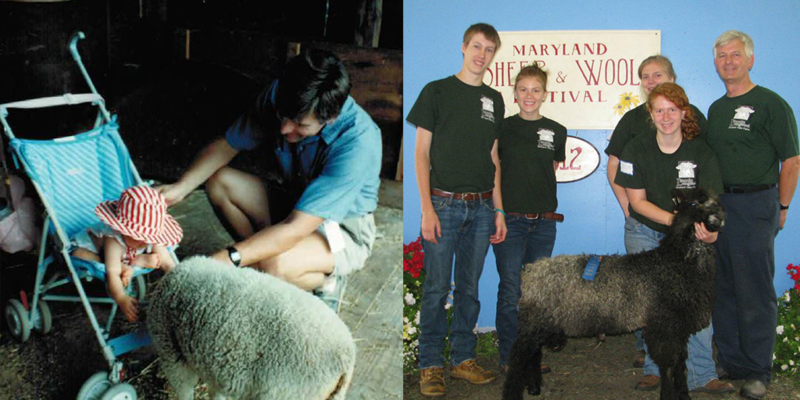 Last Spring we visited the Maryland Sheep and Wool while living in the DC area and the Lincoln Longwool’s was one of our family favorite breeds at the show. It wasn’t just all the amazing and enthusiastic shepherds but also the sweet nature and durability of the breed. I believe that the Lincoln breed maybe a big possibility on a future farm in New Hampshire. Thanks again Ashley and any recommendations for our fiber journey while we are in Alameda would be so welcomed!! I love following your adventures in Idaho!! Such a lovely young entrepreneur and a role-model! Looking forward to see her business growing! I so understand the love of Lulu, my grandfather was a dairy farmer! Her story is so amazing! Be still my sheep-lovin’ heart! I completely see how Emma could be in love with her Lincolns! I am smitten as well! 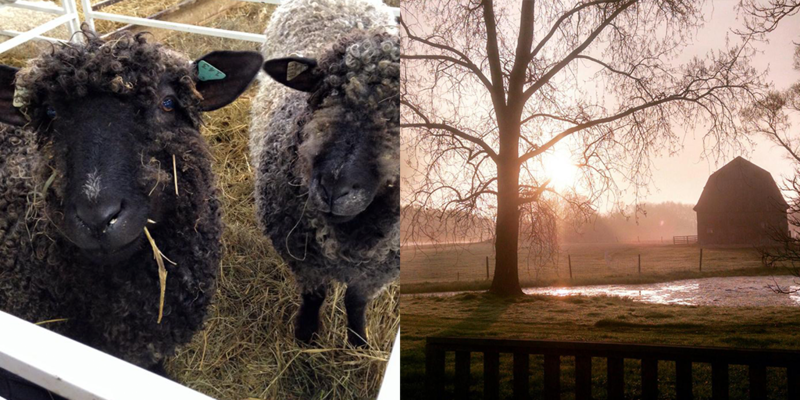 Really loved learning about them – and the rarity/challenge of black sheep! Will keep that in mind with my black & white speckled Foxy Finn Girl. Would love to knit with these sweet Lincoln’s though … Thanks for another awesome giveaway! Your podcast is so inspiring! I’ve been listening every moment I can. I can’t wait to have a bigger place in the fiber industry than simply as a consumer. Thanks for helping my dreams become goals! The sheep are so adorable and the yarn looks lovely. I love your podcasts. Keep em coming! Interesting and informative as usual always looking forward to the next podcast! Exciting! thanks for another great podcast! So exciting to hear from a young “entrepreneur”! As a young person with big aspirations for breaking into the fiber industry, it’s very uplifting to hear from someone who is accomplishing that with such fervor. Some days it can seem like an impossible dream, but your podcast and interviews like this keep me working towards that goal. Thank you! I remember writing a nearly identical persuasive essay on why we should get sheep for my parents! Unfortunately, the answer remained no, since we didn’t have a barn or land for it, but boy, was I jealous of my friend and her family’s flock. I spent an inordinate amount of time at her house playing with the “woolies” and helping out there when I could. Thank you for sharing this story! 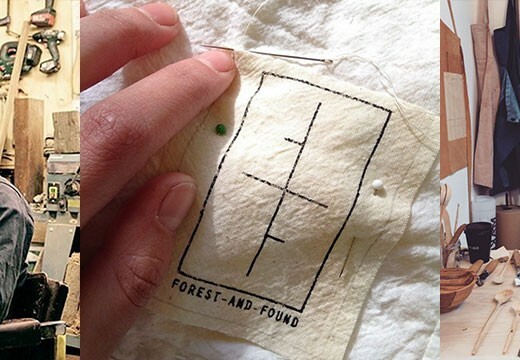 I love learning more about the fiber world through this podcast. 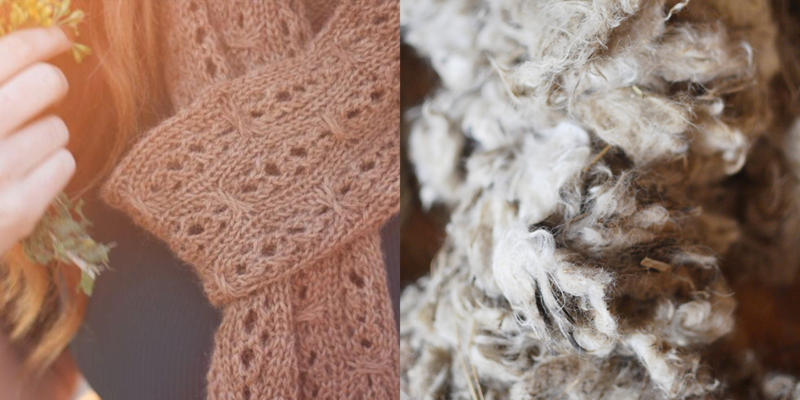 I also can’t get over the beautiful natural colors in that wool, either! Gorgeous! I loved this interview! And the grade school writing assignment is so cute. A friend of mine (who has more land and fewer children than I) keeps talking about getting sheep. This just made me want her to hurry up and do it! Such an interesting episode. I loved hearing about raising sheep from someone whose first thought is not the wool. I love this story and Emmaline should be proud of what she did! This interview was so great! Keep going Emma! What a wonderful story! This is my first time visiting your site….what a great place! It’s great to hear from someone who has so much passion. I really enjoyed hearing about the agriculture too! Just wanted to say how inspiring this podcast was! I totally admire Emmaline for identifying her passion and following her dram at such a young age! Great podcast! This was such a great story. Thank you for sharing it! What a great story! Thank you for sharing it! Great interview. Amazing to find a teenager/young adult with such commitment. What an absolutely delightful episode! Emma’s passion and enthusiasm will take her far. I’m so impressed with Emma. What a dynamic young woman. Her early passion for sheep was so endearing. Ashley, I also really enjoy your updates on the ranch. I’m living vicariously through you. I really enjoyed this podcast. 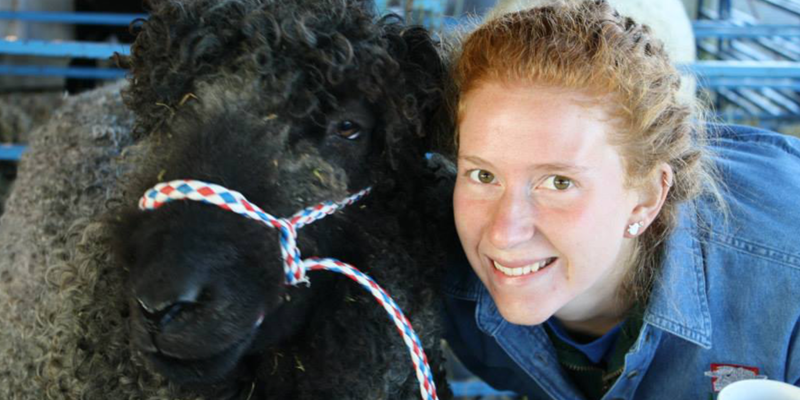 What an inspiring young women and those locks of long wool on this post are gorgeous! Thanks for sharing such inspiration! P.S. Lulu is adorable. What a sweet face! What a lovely episode. I thoroughly enjoyed hearing all about Emmaline’s journey and her amazing Lincoln Longwool sheep. They’re gorgeous! I loved this episode! What an inspiration Emmaline is! I loved hearing her story! I always admire people with such drive, a good reminder that realizing dreams is hard work. Thanks! Great podcast and love the new animals! Such an enthousiasme, what a lovely story. Love to try their wool! Thankyou for this oppertunity! 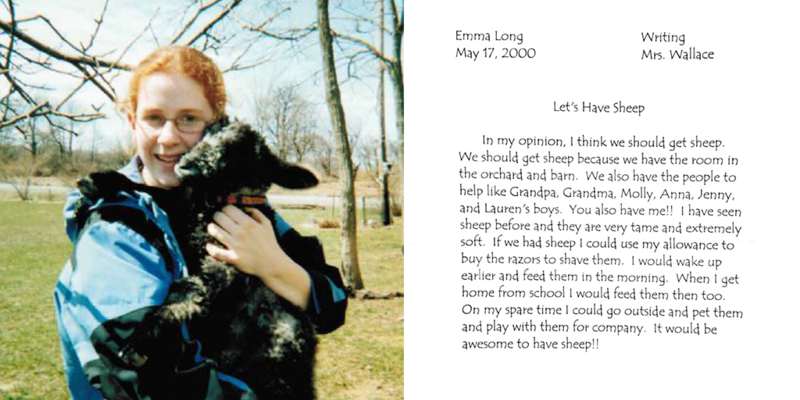 Hi Ashley – it was fun to hear Emma’s story, and see her little essay to get sheep. I am currently learning about the different sheep, just learned about Lincoln’s yesterday, as a matter of fact, and it was fun to hear/see some real life examples. Thanks for sharing and bringing some community to Canada. Fascinating to hear more about the agricultural side of wool. And to experience Emmeline’s love and enthusiasm for her flock. What fun to hear this episode. I spent some years in that area, and still visit family there (further up Rt 19). I bet I know Emma’s grocery store, liquor store, and sledding hill, lol. Now, on visits up there I’ll make sure the kids peer out the car window to see if they can spot Lincoln Longwools in Bergen. We’ll keep an eye out the next time Lincolns are the featured breed at MDSW too. Ashley, please make sure this comment isn’t entered in the drawing – I already won once! I loved Emmeline’s heartfelt and earnest essay “Lets Have Sheep”; could there be a better title? Likewise, I am in love with Lulu’s sweet face. I very much envy your experience and look forward to all of your updates. Thanks for bringing your journey to the world. The sheep are so cute! Thanks for a great podcast. As always, I really enjoyed listening to this episode. This was a great episode, fabulous to hear about someone pursuing their dreams! I just discovered your podcast and this episode was just what I needed as I come off of the Rhinebeck high. 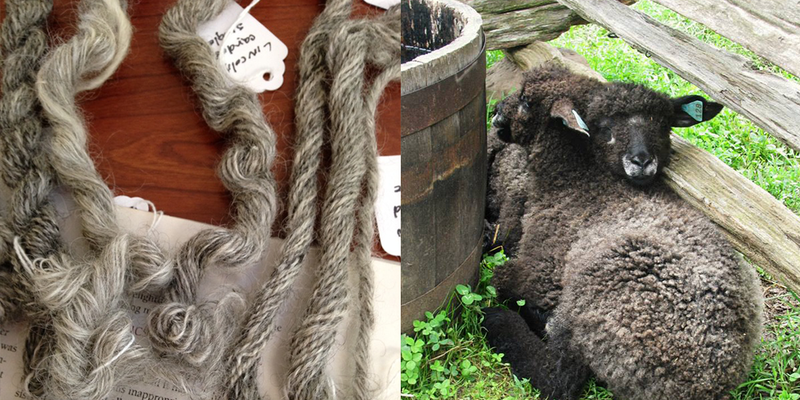 I took a spinning class at Rhinebeck this year and I’m fascinated by all the fibers different breeds of sheep produce. The natural colors are so beautiful! 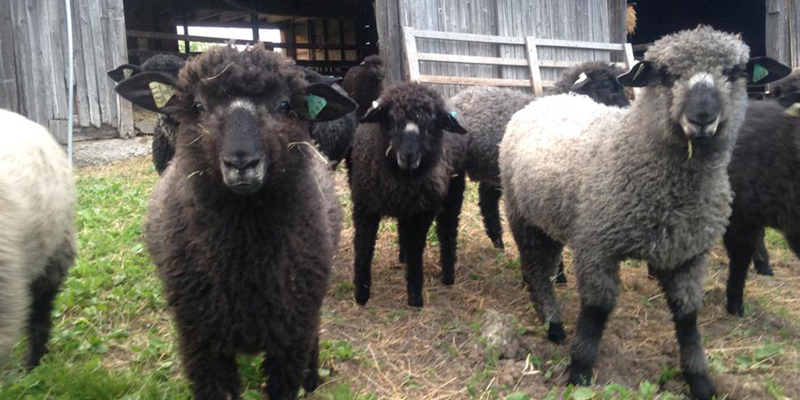 I’ll definitely look for the Lincoln longwools next year at Rhinebeck. I loved hearing Emma’s story! She is taking on so much, it’s very exciting. I just love hearing the passion in her voice. So happy to hear of your newest additions! They are both so beautiful! Those are some lovely sheep! Thanks for sharing them with us! Can’t wait to listen to this episode, and the yarn you are giving away looks luscious! I just discovered Woolful via the Green Mountain Spinnery’s news-email. What a wonderful discovery! I’ve bookmarked you and plan to “tune in”! I laughed reading the essay. What parent could read that and not give in!